1. Only registered 4-H and FFA members (including cloverbuds) may show livestock. 2. If required, registration papers in the exhibitors name must be provided for animals they are exhibiting. 3. Exhibitor must show their own animal. 4. Parking in designated areas only. No Parking In Alley. May be towed at owners expense. 5. Before leaving, area should be cleared of all debris and left as found. 6. All property of every character entered for competition or any other purpose, or being anywhere on the fairgrounds, shall be under the control of the Fair Board. In no case shall the Fair Board be held responsible for any loss, damage or injury of any character or to any such property while under their control, or at any time or place. 7. 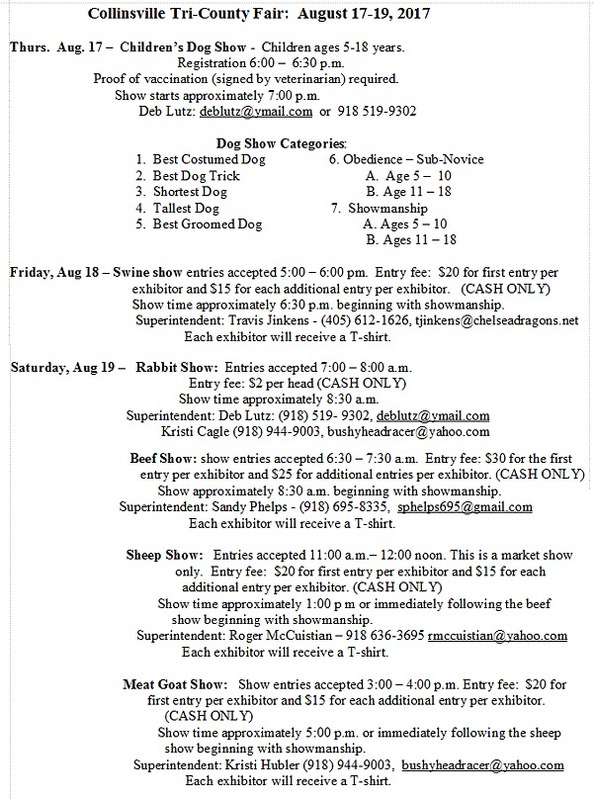 The Tri-County Fair Board reserves the right to interpret these rules and regulations and to arbitrarily settle all questions or disputes arising in connection with the Tri- County Fair to be held under the management of this Board. 8. Under no circumstances will any drug or drugs be administered to animals while at the Tri-County Fair. 9. All protests must be made in writing and accompanies by a $50 cash deposit. Deposit will be forfeited if protest is not sustained. The said protest must state plainly the cause of the complaint and must be filed with the Department Superintendent within 30 minutes after the award is made and ribbon is placed. 10. Superintendents shall have the discretion to divide market animals into weight classes and number of animals per class as deemed necessary to make the show fair and equitable for the majority of the participants. 11. No alcohol beverages allowed on the premises. While the Tri-County Fair Board will use all diligence and every precaution to ensure the safety of exhibits, the Fair Board will in NO CASE be responsible for any loss or damage which may occur.